Dongguk University has been selected as one of the “Leading Universities for Start-up” for six consecutive years, including 2016. “The University Start-up Business Support Program” fosters the university as a cradle of business start-up by designating universities with infrastructure to support business start-up and implement founding education, discover business start-up items, commercialization, marketing, and so on. For example, “Nego” and “Stepin” were supported by this system. “Nego” is a company providing information about the lowest price and “Stepin” is manufacturing spoons designed to prevent hand-shaking. Thanks to financial supports, they were able to win the Dongguk Business Start-up League. Dongguk University has a business start-up-linked major curriculum. This is created to let students experience the process of making a start-up business and to produce talented people with executive ability. Now, about ten students are studying, and following this curriculum. In addition to this system, Dongguk University provides foundation item commercialization class. This is an actual professional business start-up education for students who are willing to start-up their own companies. The school started permitting the leave of absence for business start-up in 2014, for the first time in Korea. This system started to help students who have had trouble in managing their grades because of the preparation for their business start-up. To select its participants, Youth Enterpriser Center checks if the plan violates law and a professor assesses their plans. Then, when the college approves, they can take time off up to two years. Until now, 39 students have joined this system and last year, three teams (personal branding, Buddhist supplies, and products for blinds) got a chance. There are more programs that stimulate companies to grow globally. Columbus Internship Program helps students who dream of international business start-up to go abroad and cultivate executive abilities by visiting local start-up companies and experiencing their culture. Although these programs help students willing to start-up business, there are still several limitations. First of all, newly-founded companies have difficulties on managing themselves. Even though the Business Start-up Support Group offers preparation plans for this, subsequent support for new companies is biased financially. In other words, development of each companies such as globalization plans are done by themselves. Looking at the conditions of the Korean start-up companies, it is easy to start companies but is difficult to survive and develop them. It is hard to recover the failure because of the Solidarity Guarantee System which deals mostly with soliditary things when they have trouble managing their companies.Therefore if someone starts business start-up just because of digressions such as “Because getting a job is too hard,” or “Business start-up would make huge wealth,” they will have hard time succeeding in making their new companies. 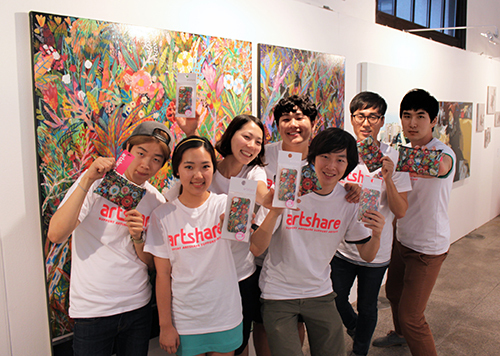 ▲ Artshare employees are taking a picture holding their product. A. Hello. My name is Kim Jun-sang (Graduate, International Trade) and this is Jung Ji-hae (Graduate, Sculpture). A. “Artshare” is a design studio that manufactures collaboration goods which can make customers feel the artist’s sensitivity since we cooperate with various artists and designers not only from Korea but also from other countries, with our motto to routinize art. Moreover, we aim for an art platform that connects artists and the public by sharing part of the profit with artists. Q. What is the motive of your business start-up? Have you thought about founding before you entered the Dongguk University? A. We have taken “Theory of Entrepreneurship” class from professor Lee Young-dal, and wanted to challenge what we really wanted to do. Q. What kind of support did you get from the Business Start-up Support Group of the Dongguk University while preparing for the business start-up? A. We could grow up thanks to the support of office, expenses of initial operating, and item developing from the Business Start-up Support Group. Q. While doing business start-up club activities, what were the beneficial results and hardships? A. In fact, we felt a sense of failure a lot because it was our first time. Also we wished for a life, finding values we want and challenging with leadership, creativity, and innovation by ourselves. We felt that we have passion about what we are doing now.